3M Performance plus twist-on wire connector accommodates 22 - 8-AWG conductors. 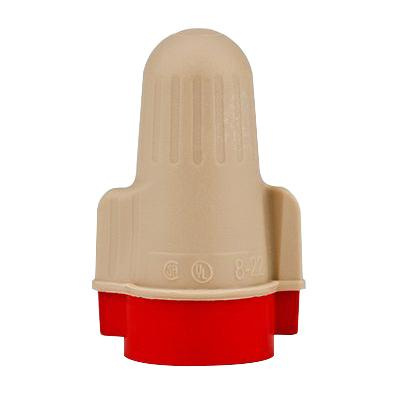 Connector in tan/red color, has steel spring construction and polypropylene/thermoplastic elastomer insulation. It withstands voltage rating of 600-Volts. Connector measures 1.17-Inch x 0.76-Inch. It has V-2 flammability rating per UL94 to withstand harsh environmental conditions. It withstands temperature rating of 105 deg C. Connector is UL listed, CSA certified and RoHS compliant.